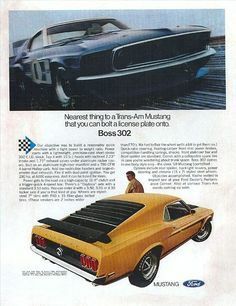 The Boss 302 is a huge part of classic Mustang history but, as improbable as it may seem, the car buying public only had about two years during which to nab one, making this professionally restored 1970 Ford Mustang Boss 302 especially compelling. It's sporting massive curb appeal, with a high-impact color correct medium blue metallic exterior you have to see to fully appreciate. Comes complete with a Marti report to testify that it's the real thing. As far as road-readiness is concerned, this Boss has things covered. Raise the hood and you'll come face to face with one seriously clean engine compartment, at the center of which sits a 302 cubic inch V8 that's ready for action - it's running and sounding great and is nicely dressed with a pair of badged Boss 302 valve covers matched by the air cleaner on top. The engine pairs with a 4-speed manual transmission to put maximum control in your hands. The light weight 302 motor allows for significantly improved acceleration, handling and cornering. The exterior is finished in a gorgeous medium blue metallic and is laser straight. The rear spoiler and louvers give a menacing stance, this car is not to be messed with! The paint is in impressively good condition, it's got a great shine from front to back and the signature "hockey stick" stripes starting on the hood before descending down to the sides look very sharp. All the original glass is there and in excellent condition. The interior is a nicely restored blue comfort weave vinyl and feels very original. The Hurst shifter ties it all together nicely and gives that period correct muscle car feel. This mustang was restored to original specifications and looks as though it could be a new car from 1970. The entire undercarriage floor pans are painted the same color as the body and the suspension has been completely rebuilt to OE specs and painted a nice semi-gloss black. If you are in the market for a beautiful, professionally restored Boss 302 look no further!